We are proud to be different and this is clearly reflected in the way we offer training as there is no such thing as a ‘one course suits all’ but that is exactly what most other companies offer you for the £1,500 to £2,000 they want from you. We prefer to offer you a choice of hourly lessons (2 to 3 hours at a time if you prefer) or group them together in a course. There is usually a very high fallout rate for people trying to become instructors with only a small percentage making it all the way but our training is so effective that we are proud that ALL our trainees have become fully qualified instructors. If you are looking into other company’s see if they can say the same! Below are some details of the training we offer for each part, but we are happy for you to contact us if you would like any more details. 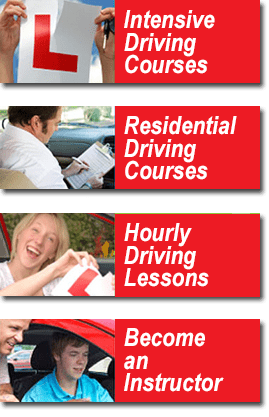 We are very happy to help you towards passing this test but it is far more cost effective for you to order training books and most question papers through somewhere like Driving School Supplies Ltd and study yourself. Now you can see just how different our approach is towards your training as we have not come across any other company offering you this! Since passing our driving test we all pick up bad habits so it is almost certain you will need some professional help to pass this test. We will point out your faults and work towards correct them but I would suggest plenty of practise before taking your test just to be certain the nerves on the day do not bring out the old habits. If you are booking a course to cover this I would always recommend booking a longer course than you feel you need just to be on the safe side and time not required will be spent working towards your part 3. Personally I feel this is the toughest of the three tests and some professional help is a must. There is so much to cover here and I believe if you want to cover this in a course it is best to do this in two sections, you can then learn the basics for you to go away and build on before taking it to the second level. We will focus on all aspects of teaching and we will also cover a lot of role-play to make you confident in giving instruction all of which will be given by a fully qualified instructor who has achieved grade 6 status for the last 20 years, will any other company offer you this? I hope we have convinced you to find out more so please contact us for a friendly chat. For most people this is the most important factor but in reality with so many ‘new’ instructors struggling to earn a living it is more important to get the correct training! Here at Academy I feel we tick both boxes here with our different approach to teaching. As always the choice is yours but it is worth pointing out that most of our trainee instructors have started with other firms and then turned to us as a last resort after finding that their training is not going well! If like them you have gone elsewhere and are struggling to get through any parts then please do contact us for our expert help. So to the price, just £35 per hour! No signing up to a long course for £2000 plus, as everyone is different with different abilities we adjust the hours to your ability. Yes, but no small print, the extra costs involved are for your test fees as show on the previous page, training books if required, and accommodation if required. We also offer a how to run your business course which we highly recommend so you do not make the mistakes most instructors make when starting off. To keep your costs down we would first recommend you get the books and study for part 1, then as soon as that is passed book a course with us. 15 hours works out at £600 or £670 with accommodation it includes some training material and it will get you well on your way to part 2 plus you will then be working towards part 3. Extra days can be added to this at just £175 per day (5 hours training) or £210 with accommodation. We will then advise you on what we recommend before you take part 3. This is a fraction of the price that most other firms offer and is usually given on a one-to-one basis.